March 4 is a national day of awareness led by the Special Olympics. 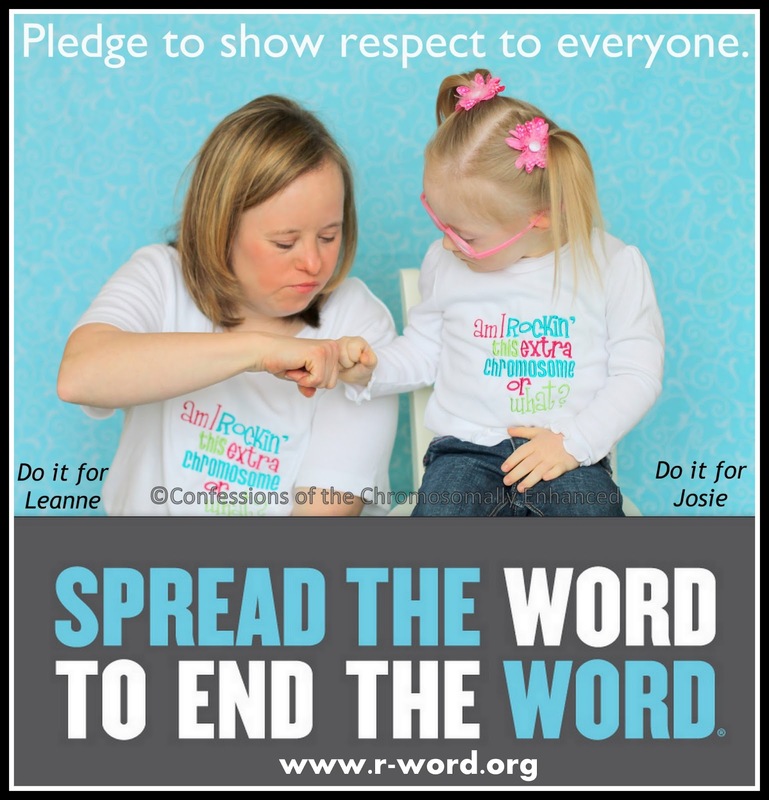 It's designed to end the use of the r-word (retarded) in popular slang. When the word "retarded" is used as a synonym for "stupid" or "foolish," it is insulting to individuals with intellectual disabilities. Over the years, I've heard the word "retarded" thrown around by friends and acquaintances and I honestly don't think anyone intends it to be hurtful. I don't think people usually realize the association between an insult like "that movie was so retarded" and my daughter and sister. Historically, the word "retarded" was once a diagnostic term to describe an intellectual disability, like Down syndrome. It has since been incorporated into common vernacular to be used as a put down. How does that sound to me? Josie and Leanne have Down syndrome. Down syndrome is characterized by a degree of mental retardation. It's not a bad thing. People with mental retardation can learn; but it just may take them longer. It doesn't make them inferior - they just learn at a different pace. You say: "That movie was retarded"
Suddenly a term once used to describe a condition that my daughter and sister possess; a condition they cannot help; a condition that makes them different - but not less than - those without it, is suddenly equated to stupid...idiotic...foolish. You simply said you didn't like a movie. You certainly didn't mean to call my sister an idiot. I get that. But it stings. Because she's not an idiot; and she did not ask to be a slower learner. In fact, she works twice as hard to achieve tasks that we take for granted. And she does it without complaining. I think that makes her pretty darn admirable; not an idiot. So what am I asking of you? Remove the word from your arsenal of slang terms. If something is stupid, call it "stupid," not retarded. It's that simple.